Have you ever cheered for the UNDERDOG? HAVE YOU EVER CHEERED FOR THE UNDERDOG? Most people have. Even when our favorite sports team is the big favorite, we generally give some respect to the underdog team. We especially like stories of a small group of fighters who defeat a much larger foe. UNDERDOGS often live nearby and maybe touch our lives briefly – amputees, cancer survivors, famous athletes, champions of extreme weight loss, and entrepreneurs who start with basically nothing but their will to overcome. The list goes on. UNDERDOGS TEACH a lesson to us all. Overcoming adversity, especially the severest sort, is usually a matter of will and faith. 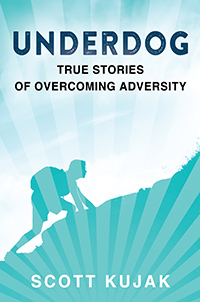 In this book, you’ll see the REAL STORIES of underdogs who strived and won against unimaginable odds. Prepare to be inspired and UNLEASH YOUR OWN UNDERDOG SPIRIT. © 2019 Revival Enterprises LLC. All Rights Reserved.